Jean Kazez: Does Pain Subtract? There's a very simple, crude way of thinking about value. Pleasure is good, pain is bad. A chunk of your life, from two hours to two years to the whole thing--is good or bad to the tune of the pleasure minus the pain. Even if I was prepared to accept an experiential standard for judging lives and chunks of lives (which I'm not--see chapter 4 of The Weight of Things), this would have to be the wrong way to go. Looking back on our two weeks in Europe, it's all wrong to say the pain was simply a negative, subtracting from total good. (1) You get really sore feet if you walk all over Rome all day, but the soreness is a part of a total experience of working hard, seeing everything, being industrious...that I like. I'd get rid of some of that, if I could, but not all of it. (2) Second, the "pleasure minus pain" equation doesn't capture how we really think about whether pains are "worth it" or not. We endured about an hour of crowds, heat, and our own squabbles as we made our way through the gigantic Vatican museum for the sake of 20 minutes of gazing at the Sistine chapel. (Then went through a second time to look at everything else--this was not quite logical.) It's not at all impossible that the total suffering exceeded the total pleasure yet I judge the pleasure worth the pain. What I'm thinking, apparently, is that the heights of pleasure enjoyed while gazing at Michelangelo are worth enduring all that misery, however the total quantities (duration times intensity, with quality incorporated somehow) compare. (3) Last but not least, pain can make for lasting memories. In a way, travel is pretty dumb. You go to marvelous places like Rome for a few days or weeks, just to wind up back home long term, finding your environment even less interesting than before (especially if you live in Dallas). The sore feet give your memories (including the pleasurable elements) greater staying power. Example: I stepped on a sea urchin in Hawaii last summer, which was seriously excruciating. I remember that day--what gorgeous skies! what amazing spinner dolphins! what superb underwater corals!--extremely well. So... pleasure minus pain, bah! It seems that we need pain and suffering to grow or to learn. Pain and suffering force us to think, to reexamine our lives (and our health habits), to focus on our mortality, to become more aware of our body and of who we are: smooth, comfortable lives produce superficial people. Suffering can destroy us, but, as Nietzsche says, what does not kill me, makes me stronger. And I would add, not only stronger, but often (although not always) wiser. Oh that is just too funny, too really freakin' wild. I'll tell that to my triathlete friends. Did we have a good race? I mean after we make our tidy subtraction for ouchies and wah wahs. Whatever happened to Embrace the pain? If the pleasure of seeing the Sistine Chapel makes the pain of the crowds, heat, and sore feet worthwhile then it would seem that the pleasure must outweigh the pain. Of course, the pleasure goes beyond merely gazing at the painting. Memories, satisfaction, a sense of achievement etc. can make sore feet almost a pleasure to experience. Pain vs pleasure is not an accurate reflection of how we value things. Pain is not necessarily the same as suffering. Pleasure is not necessarily a source of happiness. That's why it makes a ton more sense to talk about utilitarianism in the sense of people's preferences. You'd prefer to keep some of the pained feet, because you wear them as a badge of honor, a day of accomplishment. You PREFER to have them, although you would prefer even more that they didn't hurt quite so much. The third scenario is kind of what most people point to when defending things like utilitarianism. I step on a sea urchin, experience great pain, and that's all I remember from my trip, the sea urchin pain. Or I got sea sick on a boat, that's all I remember. Now if you remembered other things because you stepped on a sea urchin, I think its a different scenario. Its hard to say that you would have remembered everything in such great detail had you not stepped on the urchin. So maybe we can say that we prefer to experience some kind of trauma on beautiful days? That doesn't sound right. Maybe you're appreciative of the misfortune in hindsight, but since utilitarianism is about decisions we make, more so than anything, I'm sure few would prefer to step on a sea urchin. Ed, The Sistine chapel example is supposed to show how assessing a chunk of a life does not turn on totals. It might very well be that the visit involved more total pain than pleasure, but it was still worth it because of "the peaks" enjoyed while looking at Michelangelo. So--peaks matter, not totals. Wayne--Cool big globe thing! I also loved the map room. I think case (3) is actually not so interesting--it just shows that pains can lead to pleasures, which nobody really denies. But (1) and (2) do conflict with the standard version of the hedonistic view of value. I think you're right about (1)--a preference view helps. But re: (2). 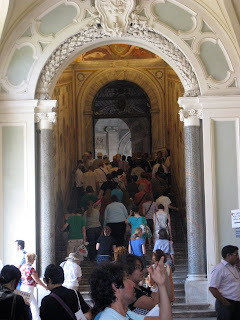 During my 5 hours at the Vatican museum a lot of my preferences were thwarted--like the preference to avoid crowds, etc. On the preference view, we still tally up minutes spent satisfied and dissatisfied. It could be there was more preference dissatisfaction than satisfaction, on the whole. Yet since the "peaks" were so high during the 20 minutes in the Sistine chapel, it was all worthwhile. So--shifting the focus to preferences doesn't seem to help explain why those 5 hours were overall good, not bad. But preferences aren't discreet units like "hedons" are. I can have stronger or weaker preferences. I have stronger preferences for seeing the Chapel, than not. The preference is stronger than the aversion to waiting in lines. And here's my photosynth of the vatican ball thingie. There are stronger and weaker preferences, but it could be that when all is tallied up, the total amount of dissatisfaction was greater. It could be 10 units of -10 level dissatisfaction, and 1 unit of +20 level satisfaction. So as far as totals are concerned, traipsing through the museum was a bad way to spend 5 hours. But because the peak is so high, "worth it" in the end. The question is whether the peaks or the totals matter. If the peaks, then pain doesn't automatically lessen the value of the 5 hours. Now to look at the ball thingie. Jean, I understand your point, but I'm not convinced it's accurate. I think that total pleasure experienced must outweigh total pain experienced for an event to be perceived as worthwhile. Peaks matter because they are such heavyweights in their emotional impact. A whole lot of medium weight pains all day may still not total more than one heavy weight pleasure. Am I nitpicking? Probably. It's a bad habit of mine. Ed, Not nitpicking, but I don't really see why what you say should be true. A peak pleasure can come only after a long period of great misery. It just may not be true that "the most pleasure" is afforded by pursuing the peak pleasure, it you tally it all up. For example: 5 days of suffering while hiking up Everest, 5 minutes of utter joy at the top. It's not obvious that the joy at the top (for that short time) is really so great that total pleasure exceeds total pain. Still, if I want to have that utter joy, the only way I can experience it is by going through the misery. Caring more about peaks than totals does not strike me as irrational or as all that uncommon. Blisters and Michelangelo. Some kind of masochistic high? Let's not confuse it with athletic effort, at least not the kind I have experienced doing a couple hundred triathlons, including the Hawaiian Ironman 6 times. Pain is not good. It indicates injury and its cause should not continue. One wants to win, especially over one's own performance. It's a physical and mental thing. We look for strength and endurance, build muscles and stamina, and are most satisfied when our limits are stretched, our abilities increase, especially if the other guy's doesn't so much. But wanting to hurt? Say wha'? This is some esoteric weird ambition. At my race on Saturday, I was 8 minutes faster than last year. I could do that because I did not hurt and I felt less strain, so I could push harder. I'm glad the blisters deepened the experience of the Vatican ceiling, but it won't get me where I'm going.